The satirical website, Babylon Bee, took aim at the “fresh face” of the Democrat Party, Alexandria Ocasio-Cortez (D-NY), and it couldn’t have been funnier. 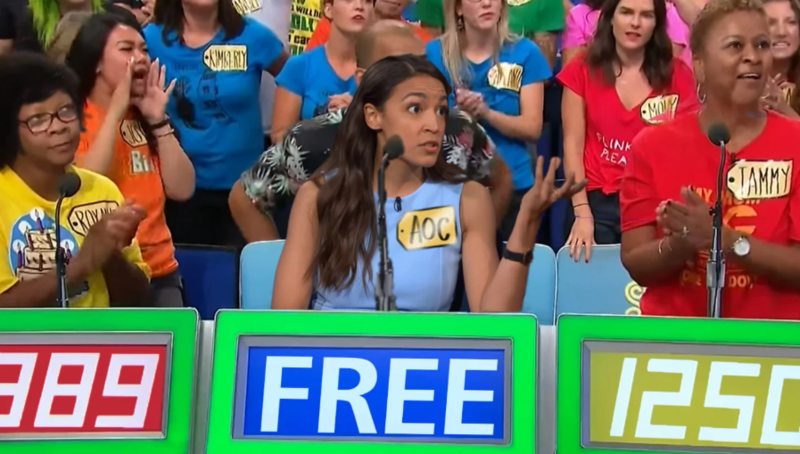 The piece describes a fictitious appearance of the millennial congresswoman on the hit game show The Price Is Right. The premise of the show is for contestants to guess the price of featured items. The closer a contestant gets to the actual retail price, the greater the chances they have in advancing to the next round. During this satire piece, Ocasio-Cortez shouts “Free!” for each and every luxurious item. Ocasio-Cortez, who holds an economic degree from Boston University, is infamous for her complete lack of understanding about basic economic principles. She once suggested that the record-low unemployment rate under Donald Trump is simply due to Americans holding down multiple jobs. She once stated that she was puzzled when people asked her how she was going to pay for free medical for all. In her mind, seemingly, free healthcare for all was the cheaper option. In a more recent look into the inner workings of Ocasio-Cortez’ mind, she used a congressional hearing to ask why a bank, financing an oil pipeline project, should not be held responsible for the cleanup of any leaks from the pipeline. This is comparable to asking why a car manufacturer should not be held responsible for a customer using that car to injure another person or destroy property. These are just a couple of instances in which Ocasio-Cortez expressed a complete lack of understanding about basic economic principles, but there are plenty more. It begs the questions as to whether or not Boston University is embarrassed for granting this woman a degree in economics as well as whether or not there is someone behind the young congresswoman who is pulling the strings. In any event, the Babylon Bee article does a great job of poking fun of the Democratic Socialist’s mindset that the price of her socialist policies are irrelevant. The Babylon Bee has many more of these types of articles and if you haven’t bookmarked their website yet, you should do so. It’s always important to make time for a few laughs each day.